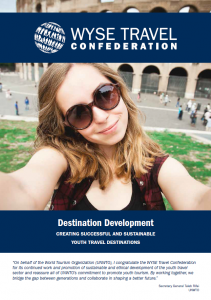 WYSE Travel Confederation works to raise awareness of youth and student travel as one of the fastest growing sectors within travel and tourism, supporting 67 million jobs and generating 2.4% of global GDP. WYSE Travel Confederation is the only global body that brings together all major players in this industry, enabling them to speak to governments and international bodies with one voice. When advocating on behalf of the industry, WYSE champions policies that are inclusive, pro-growth and based on solid research. Tourism can only make its fullest contribution to the world’s economic and social wellbeing if governments are awake to the potential of youth travel and fully understand its impact on destinations. Countries are facing increasing levels of competition when it comes to tourism and recognise that in order to become and remain an appealing youth travel destination, a youth-focussed destination development strategy is required – one that is founded on facts, draws on collaboration, and drives visitor growth through unique inspiration and creativity. How hostels can approach their relationships with Online Travel Agents. A tool for developing fair agreements between Online Travel Agents (OTAs) and hostels. How destinations can tap into the potential of youth and student travel. A tool to highlight the economic, social and cultural importance of youth travel to governments worldwide. How youth and student travel agents can develop a position paper. A tool for communicating the critical role that visas play in enabling cultural exchange opportunities for youth.